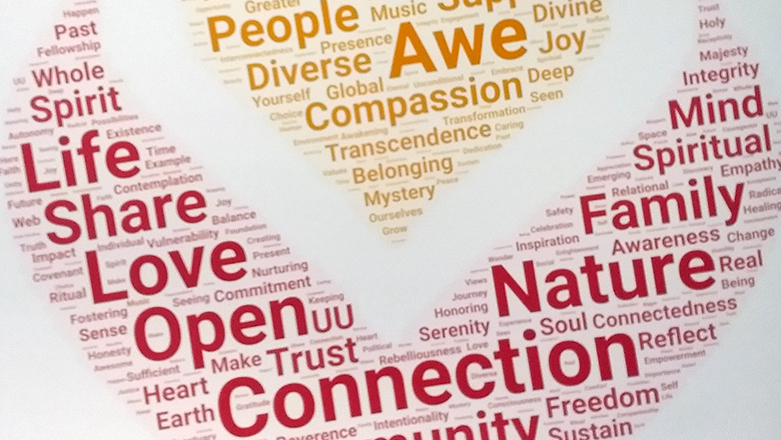 This past fall, our congregation and our board of trustees exceeded all expectations by engaging in huge numbers in a visioning process that has resulted in a short list of core values and seven bold vision statements that we are excited to present to the congregation at our Jan. 27th town hall meeting. Why should we care about crafting values, mission, and vision statements? Because as Unitarian Universalists, we not only allow, we insist on individual determination of belief, so we can’t fall back on dogma or historical statements as our reason for being and belonging. Because without this clear vision of how we want to change and grow ourselves, our congregation, and the larger world, we risk stagnation and decline. Because our congregation is constantly changing and growing. People leave, new people join. Foothills continually evolves. Because studies have shown that the congregations that have actively tended vision, mission, and covenant statements are the ones that are growing — growing their numbers, growing the commitment of their members, and growing their impact on the world. And because we believe that our world needs our Unitarian Universalist perspective, our compassion, our wisdom, and our welcoming congregation. So we invite you to come hear these values and vision statements that your Board of Trustees has distilled from the wishes, reflections, and values of 350 members, friends, youth, and staff of Foothills. Please join us Sunday, January 27 at 1 pm.